Almost everyone is familiar with the famous “Snake and Stairs” (S&S) board game. We play it in our childhood and enjoy it (of course just for fun and spending our long summer days). 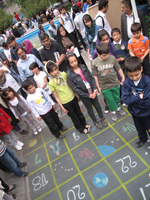 But in spring 2011 at Zaferanieh Educational Observatory (ZEO) this old board game found a new mission: Astronomy Edu. to kids. Here is what happened. First of all we set up a huge board to play the new S&S. This board was drawn on a 3*3 square meter hard cloth (like tarpaulin) with 36 cells (6*6) each of which was numbered and some of them had one of the following signs: rocket, planet, wormhole and black hole. 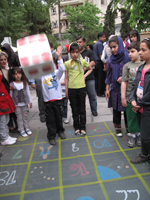 We then prepared a huge dice for the game and then the only remaining ingredients were the kids who attended the Astronomy Day 2011 at ZEO park! And now for the game rules; the first kid throws the dice and goes on the board according to their dice number. And this is repeated until all players are on board. The next rounds of throwing the dice shift the players until someone reaches a signed cell. And here each sign plays a significant role: A planet (being somewhere to live) stops you for one round, while a rocket (playing the role of stairs) “thrusts” you a few cells forward. A black hole on the other hand (acts as the snakes and) pulls the player a few cells backward. And finally the lucky wormhole would transfer a player to the final and winning cell. 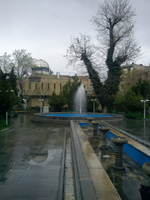 The educational role of the game is wo or three teachers stationed aroparticular sign (things like what a planet is, the namf our solar system planets and so on ...). It is also necessary to allow kids to share possible background information that they have on various objects in the game so as to encourage them to take an active part in the group. And in this way, the simple S&S outreach activity could provide a happy, fun opportunity to educate kids about astronomy.